When Cody Garbrandt had to withdraw from his planned UFC 213 title defense against TJ Dillashaw, it appeared an exciting replacement bout fell immediately into the Octagon. How about Dillashaw dropping down to 125 pounds to try and stop record-setting flyweight champion Demetrious Johnson from breaking anymore records? Garbrandt had to pull out of the fight with Dillashaw due to a lingering back injury that won’t allow him to fight anytime soon. No problem, said Dillashaw, as he’d like to challenge Johnson, the UFC’s first and only flyweight champion. The only problem with that scenario? Johnson doesn’t want to fight Dillashaw, whom he seems to think should have to fight at least once in the division before he gets a crack at the belt. Johnson appears more interested in defending against Ray Borg, who had reportedly been in the works as his next opponent before the Dillashaw opportunity came to light. A fight between Johnson and Dillashaw carries with it much more pop with fans than does a bout with Borg. 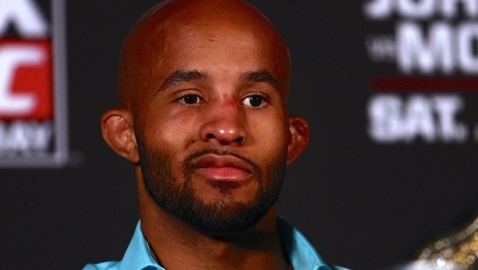 That much is obvious, and it’s something that rattles UFC president Dana White, who was incredulous when asked about Johnson’s unwillingness to fight Dillashaw. “For the first time ever, I have a fight with Demetrious Johnson, where he is on his way to break the record – Anderson Silva’s record for most title defenses – and TJ Dillashaw can’t fight Cody ‘No Love’ because Cody screwed up his back and Cody isn’t gonna be back for a while. So (Dillashaw) was like, ‘I can make this weight, I’m working on it and everything else, I’m gonna stop (Johnson) from breaking that record,'” White recounted on a recent edition of the UFC Unfiltered podcast. White couldn’t understand why Johnson was pass on the fight, after all, as the UFC head honcho explained, the flyweight champ would be in for possibly the biggest payday of his career. White, however, believes that Dillashaw has done enough to warrant an immediate title shot upon dropping to flyweight. “TJ Dillashaw is a former world champion coming down from the weight class above, who is next in line for the title shot there, absolutely he’s next in line if that’s what he wants. It’s nothing against Ray Borg,” said White.